Tarek Odom, a St. Augustine High graduate and the Times-Union’s Defensive Player of the Year in 2010, died suddenly on Tuesday night. 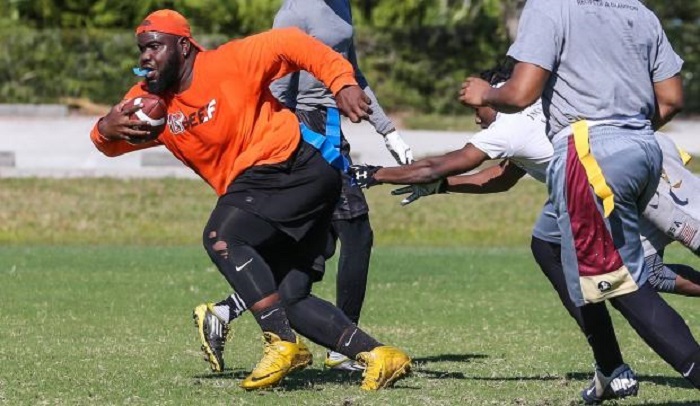 Odom, 24, was at a rec flag football game in St. Augustine when he collapsed and was later pronounced dead. An autopsy was pending, according to the medical examiner’s office in St. Johns County. Odom, who went on to play four years in college at Wofford and also had stints in arena football, had returned to his alma mater last year to coach linebackers on the junior varsity team. Odom was one of the most well-known players in Yellow Jackets history, whose quiet and gentle demeanor was a 180 from his intimidating physical presence. He was a state champion weightlifter, a brute on the defensive line who routinely drew double teams, yet one who had no problem challenging teammates to foot races, even when he was pushing close to 300 pounds. To those who knew Odom’s backstory, it was an inspiring one. Too heavy to play Pop Warner football, Odom was turned away due to his weight every year that he attempted to register. McDowell, said in a 2010 story, that she and her son left signups every year in tears because of that rejection due to his weight. Odom ultimately played one year of youth football in eighth grade in the Police Athletic League, and barreled into high school football as a 250-pound menace on the defensive line with plenty to prove. Odom’s weight climbed to 290 pounds as a junior, and he was virtually unblockable on the line. But it was during Odom’s senior season in 2010 that things changed. He lost 35 pounds, grew a couple inches and the St. Augustine staff began plugging him in as a fullback during the second half of the season. The Yellow Jackets reached the state semifinals that year, with Odom starring on the line and running the ball. He had 30 tackles for loss as a senior and 12 rushing touchdowns. Odom earned Super 24 honors, as well as All-First Coast defensive player of the year and overall player of the year accolades from the St. Augustine Record. Odom drew interest from schools like Arkansas and Florida State late in the recruiting cycle, but signed with Wofford and became one of the better players in Terriers history. He played in 46 career games, finishing with 126 tackles and 34 for loss. Odom was an All-Southern Conference defensive lineman in his junior (second team) and senior seasons (first team).